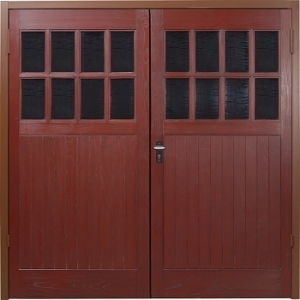 GRP Side hinged garage doors give a garage a traditional look with easy personal access and all at affordable prices. 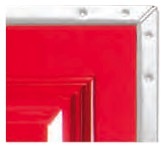 Pre-framed and in many standard sizes, they are available in white and woodgrained colours. 50/50 and 2/3:1/3 door opening options available. 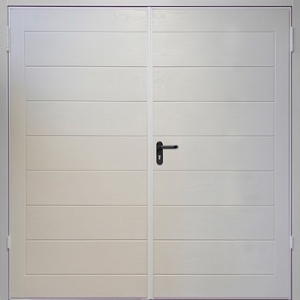 The Wessex side-hinged GRP garage doors offer the stability of plastic but the beauty of timber or high gloss white. 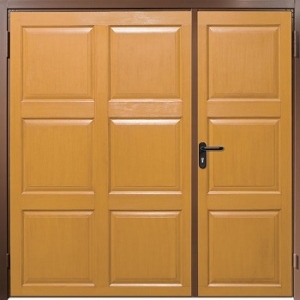 Sturdy impact resistant GRP door leaves bonded onto strong but light steel door chassis. Movement free (no door binding etc) and rot / rust free. Ideal for coastal or damp applications. 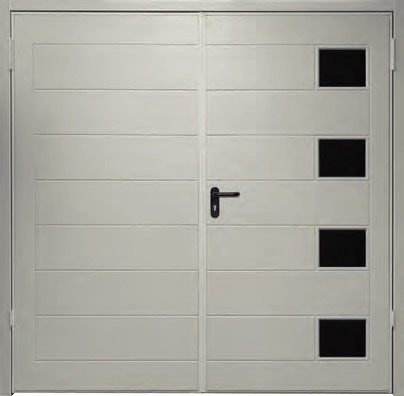 GRP side-hinged (fibre glass) doors are pre-hung in the factory on a galvanized and painted steel subframe for quick and easy garage door installation. 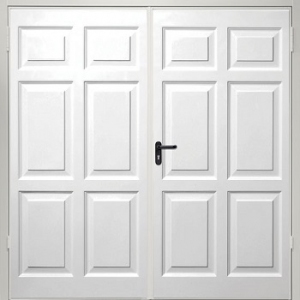 Multi-point locking secures both door leaves top, centre and bottom. 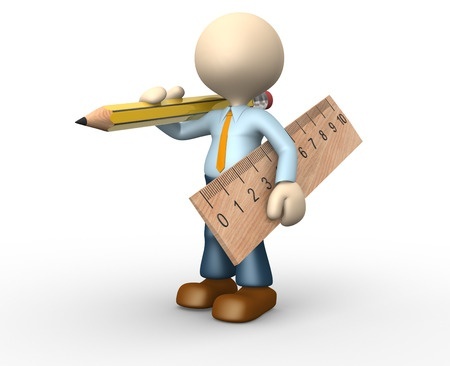 Wide range of designs, 21 colours and available in many standard sizes. 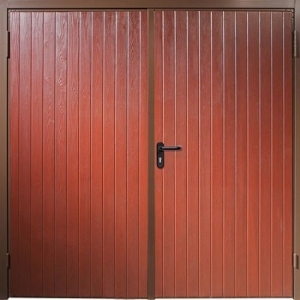 GRP side hinged garage doors explained in more detail. Glass reinforced plastic, commonly known as GRP or glassfibre, consists of thousands of fine glass strands formed into a matt or fine mesh, which is laid into a mould along with a polymer resin. The resin takes the shape of the mould and sets after a given curing time. Robin Reliant bodies, early canoes, fake chimney stacks, porch canopies and other lightweight but very durable building products are made from glassfibre. 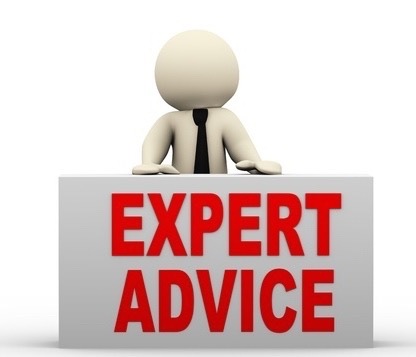 The benefits of GRP for side-hung garage doors. 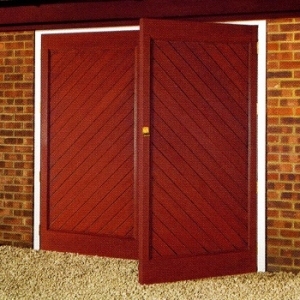 Wessex Doors developed GRP garage doors as a spin off from the boat & yacht building industry of the South Coast of England. GRP is ideal for wet or damp situations, and as material is totally waterproof and resistant to rot. Dimensionally very stable, GRP will not shrink or expand, warp, twist or crack. 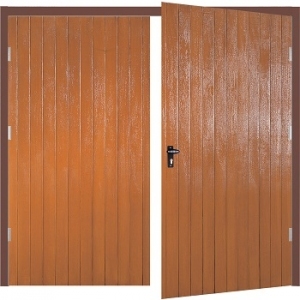 No more planing down swollen wooden doors only to be left with large gaps when summer comes! GRP does not require a lot of maintenance, just the occasional wash down with a soft cloth and a bucket of water. Some people apply car polish to add a protective film to the door, helping to keep a showroom appearance over many years. 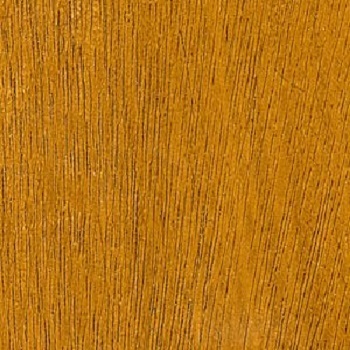 GRP has natural wood beauty but without the maintenance. The handmade timber moulds are lightly sandblasted to enhance the grain texture of wood. This is replicated in the door, revealing intricate grain detail and subtle features such as dowelled joints, stile and rail detail, beautiful deep panel mouldings and glazing mullions. Smooth gloss white models also available. As each door leaf is cast as a whole unit, there are no seams, welds or joints, greatly enhancing the beauty of the doors. Wessex Platinum GRP side hinged garage doors in more detail. 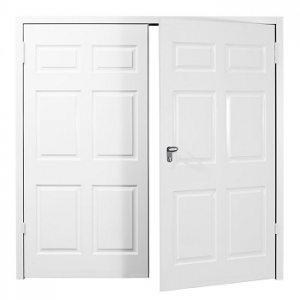 The new construction method of the Platinum side hinged large door range means that each door leaf has very strong light metal frame or chassis that provides maximum stability and strength. Strong centre rail visible on the inside hold the much improved lock. Please see photo of the back of the door. Please note however when viewed from the front each door leaf has neat and visible painted perimeters. 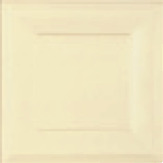 20mm wide visible chassis in either White, Black or Brown to compliment your door colour. Frames are also available to match. 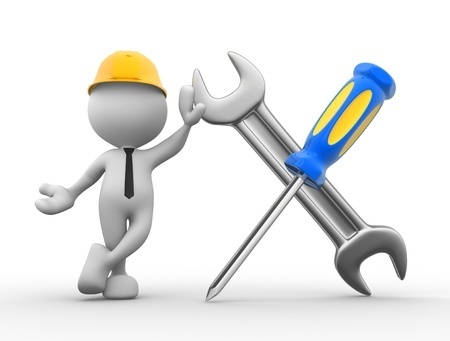 Steel chassis are galvanised and powder coated and as long lasting as GRP panel itself. The rear face of the Platinum side hinged doors is white as standard or brown as an optional extra, with the chassis in white, brown or black. 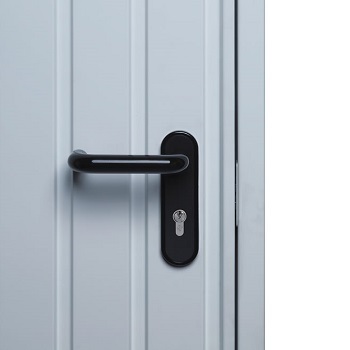 Side hinged doors have a black lever handle that operates a locking latch to the active leaf, whilst the inactive leaf is secured by a shoot latch bolt. Black lever handle that operates a locking latch to the active leaf. Shoot latch bolt secures the inactive leaf. The inside view. 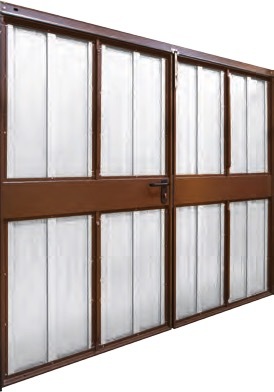 Wessex GRP Platinum side hinged door. Chassis corner details in each of the colour options. White doors will come on a White chassis. Ebony woodgrain doors come on Black chassis. 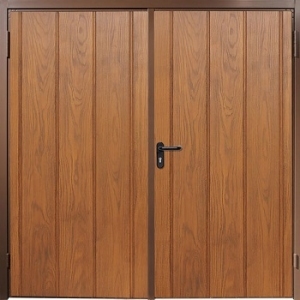 All other woodgrain colour doors come on Brown chassis. Red, Green an Blue colours and Coastal colours come on either on a White or Black chassis. Please see frame colour corner details below. Visible Brown chassis corner detail. Visible Black chassis corner detail. Visible White chassis corner detail. 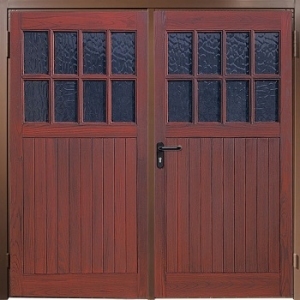 Side-hinged doors are supplied with a pre-fitted steel frame that provides simple installation and a stable platform for door operation. 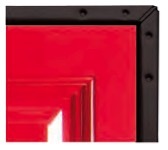 Frame uprights are 60mm wide as standard and the head is 60mm high. Frames have an exterior powder coating available in white, brown, or black. Please specify the colour required when ordering. 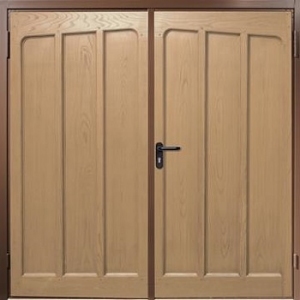 Wessex GRP Platinum range side hinged door finish and colour choice. 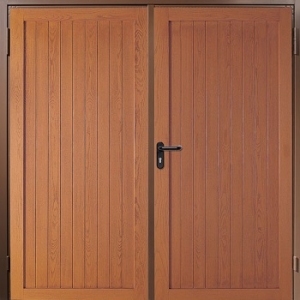 Wessex Platinum range of side-hinged doors look just like wood but with the added benefit of minimal maintenance. 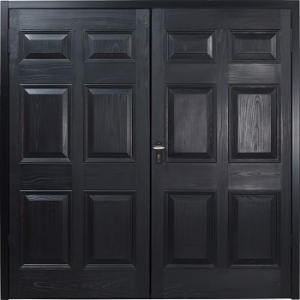 Hand finished by craftsmen, woodgrain doors are “antiqued” to reproduce the natural subtlety of timber. 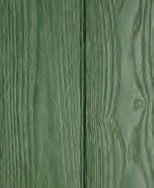 Please see the close up photograph of the GRP woodgrain finish in Green. Wessex offer 21 GRP colours to choose from. 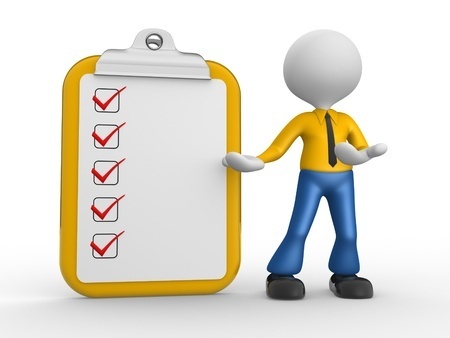 Please see some of the colours shown below. Window options on Wessex GRP Platinum side hinged doors. Wessex Lymington side hinged with optional windows.